This beautiful country has a rich heritage and splendid heritage. 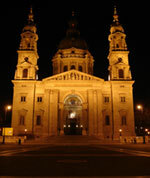 For example you can find in Budapest's largest synagogue in Europe, but also famous Roman baths. The team Trip2visit. Com has been seduced by Hungary and the Hungarians, who are always ready to welcome you. Hungary joined the EU in 2004, and it shows: the European flags were also visible that the Hungarian flags. The country has completely turned its economy toward the West since 1991.
tourism side the first to benefit are the Austrians and Germans, who have replaced the Soviet nomenklatura. Hungary has therefore been a great tradition of tourism and hospitality: no problem then to go and find a hotel, or even move on the spot, particularly in Budapest. Come on, we'll help a little if you do not find where to put your finger on the map. Hungary is bordering Austria, Slovakia ... Miss the visit to Budapest, the pearl of the Danube. Complete your stay by the turn of Lake Balaton, a passage through the vineyards and makes a leap into the Carpathians. Hurry, Hungary awaits you! >> Status Park , the statutes of the not so distant! Further east, we would leave many in Armenia, then here's a taste with a recipe Tabbouleh to a site offering good ideas travel taste! Add to bookmark this page Hungary " Hungary " - Firefox do "Ctrl D"